After more than two years of dedicated volunteer work by CORBA and MWBA volunteer sawyers, we’re happy to announce that the Vetter Mountain Trail, near Charlton Flat in the San Gabriel Mountains National Monument, will be open to the public this weekend. Our volunteer sawyer crew has been cutting downed trees off the trail, clearing brush, and working to reopen the heavily-damaged trail. It is in one of the most badly burned areas of the 2009 Station Fire, and thousands of trees killed in the fire have been falling since then. 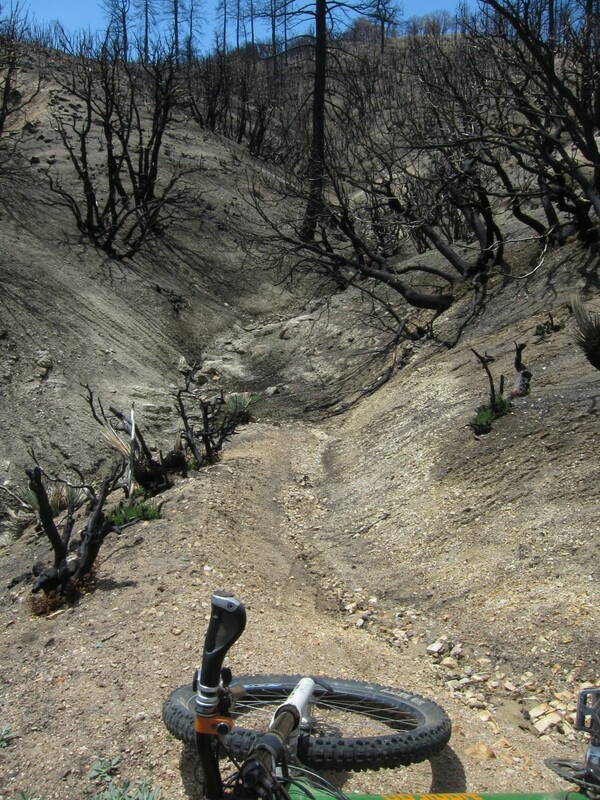 We surveyed the trail for the Forest Service in 2010, the year after the Station Fire. The area had barely begun recovering and would need several more years before work could begin. Vegetation had to grow back, hillsides stabilize, and standing dead trees would fall to the ground. Intense poodle dog settled in not long after, increasing the hazards. October 2015 we began volunteer work, needing to first clear the trail corridor as best we could, and in many cases, locate the trail. CORBA and MWBA Chainsaw crews began the heavy work. Sawyers have cut well over 100 trees that fell across the trail, and dozens more on the roads to access the trail, in ten days of chainsaw work over the last year. We cut back brush that was choking off the trail, and reopened the corridor. Three times over the past year we cleared the entire trail of downed trees, only to return months later to start again. Earlier this year, hot shots fire crews were able to fell most of the largest standing hazard trees, reducing hazards along the trail corridor. The rate of trees falling is slowing down, especially since the big windstorms of this past winter. Numerous dead trees are still standing, and will continue to pose a hazard for some time, much like many other trails in the recovering areas. Be especially aware if you’re on the trails in a burn zone during high winds or bad weather, as dead trees are especially prone to falling in these conditions. Last Saturday, at our urging, the Forest Service scheduled the annual National Trails Day volunteer project on the Vetter Mountain trail. 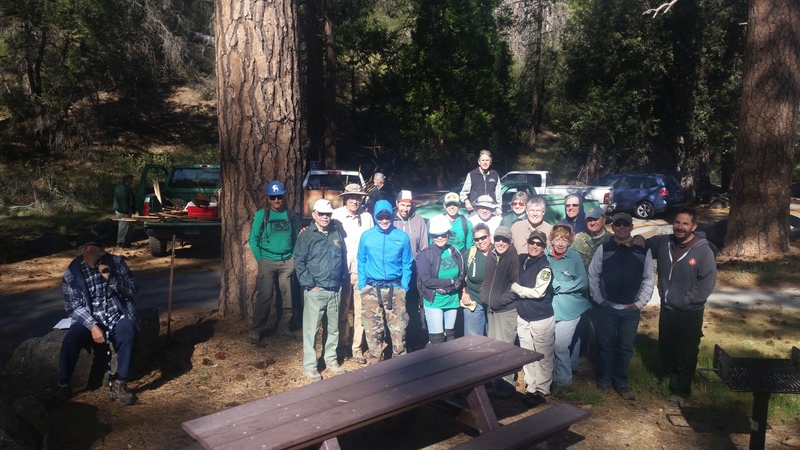 Volunteer Crews from Coca Cola, MWBA, CORBA, JPL Trail Builders, Angeles National Forest Fire Lookout Association, National Forest Foundation and many other groups and individuals proceeded to re-establish tread and cut back brush. Sawyer crews chainsawed a dozen or more trees from the trail. Sunday, CORBA volunteer sawyers returned to continue cutting the remaining downed trees from the trail. Today, Thursday May 4, the CORBA team will return to put some final touches on the trail, remove the last remaining obstructions, and officially remove the “trail closed” signs in preparation for the trail’s opening this weekend. The Vetter Mountain trail has been closed for 8 years. It is part of the classic and much-loved Chilao Figure 8, a popular mountain bike loop that includes the Charlton Connector Trail, Vetter Mountain Trail, Mount Hillyer Trail, connecting fire roads, and the Silver Mocassin trail. It has been missed, and will be enjoyed once again! Once lush with majestic conifers, and known for a series of switchbacks, followed by a flowy descent along a drainage, the trail looks much less apocalyptic than it did on our first survey in 2010. The area is recovering, but it is still within the burn zone, and will look very different from it’s pre-fire state. We’re just happy to have it back! The Vetter Mountain trail has been closed for 8 years. It was part of the classic and much-loved Chilao Figure 8, a route that includes the Charlton Connector Trail, Vetter Mountain Trail, Mount Hillyer Trail, connecting fire roads, and the Silver Mocassin trail. It has been missed, and will be enjoyed once again! Last January the Forest Service allowed some experienced trail maintenance volunteers, who had been previously certified to use chainsaws at the “A” level, to step up their training to a “B” level. Under current regulations, A level sawyers are restricted to 8 inch trees or smaller, and must be supervised. B-level Sawyers are allowed to work unsupervised, on trees up to 24″ in diameter, and can supervise and work with A-level sawyers. CORBA President Steve Messer, and volunteer Mike McGuire both received their B level certification, and have been putting them to use all year. MWBA volunteers Mitch Marich, Brad Benam and Erik Hillard also received their A level certification, along with several other individuals and volunteers from other organizations and areas outside Los Angeles. 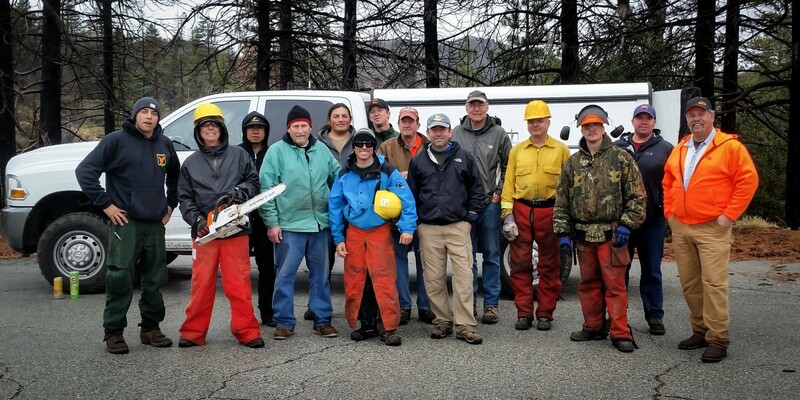 Together the CORBA and MWBA sawyer team has been cutting trees from trails all year. We’ve cut trees from Brown Mountain, El Prieto, Sunset Ridge, Gabrielino, Strawberry Peak, Colby Canyon, Mount Lowe East, Sam Merrill and Silver Moccasin trails. Six years after the Station Fire, downed trees are becoming a major and constant problem. Our biggest project has been Vetter Mountain trail. This was a favorite of local mountain bikers, as the first descent of the classic Chilao Loop (or, more accurately, the Chilao Figure-8). The area was one of the most heavily impacted areas of the forest by the Station Fire. Drought has slowed the area’s recovery, and there are still thousands of dead trees waiting to fall. We began in early spring 2015, first clearing the Charlton Flats loop road of more than two dozen downed trees just to get to the bottom of the Vetter Mountain Trail and Silver Moccasin trail. We cleared all the deadfall from the lower section of Vetter through to the first road crossing. There were many trees beyond our chainsaw certification level, the largest being just over 50 inches in diameter. These were taken care of by Little Tujunga Hot Shots Captain Greg Stenmo, whose support we were grateful to have. After the summer heat and when fire danger levels and wind conditions allowed, on October 3rd CORBA and USFS volunteers Mike and Robin McGuire returned to begin work on the next section of the trail. In a day’s work, they were only able to clear the first hundred feet of the trail, with the sheer number of trees stacked like Chinese pickup sticks. We returned on October 8th. In the five days since Mike and Robin were up there, another four trees had fallen across the road. Finally getting to the trail, we began cutting downed trees, poodle dog bush and buckthorn from the overgrown tread. In places it was impossible to see any remnant of trail through the brush and deadfall, so having been familiar with the trail in its pre-fire glory was a must. The time lapse below gives a pretty good indication of what’s been involved in clearing the trail. This is six hours of work compressed to nine minutes. We returned on October 23, and November 5. On November 5 we started from the top of the trail, near the site of the old lookout and worked our way down. It was a glorious moment for us to finally have cut and cleared over 150 trees from Vetter Mountain trail, Charlton trail, and the Charlton Loop road. After finishing, we went back and inspected the trail from top to bottom, and found a dozen more trees fallen in areas we’d previously cleared. Once again we returned on December 17, first clearing downed trees off the road, then several new trees that had fallen across Vetter and Charlton trails. Afterwards we joined the Chilao hotshots crew, who were clearing downed trees from Silver Moccasin trail after the particularly strong windstorms of December. With our help, they were able to get the job finished in one day. The trail remains closed to the public. There are still too many dead trees that have been rotting away for six years, waiting to fall every time the wind blows. More than once, when we finished our day’s chainsaw work as the afternoon winds started blowing, we heard more trees falling. Because of these dangers, we are not willing to take in volunteer crews to begin restoring the trail. Since winds have been blowing steadily this past month (over 70mph the week before Christmas), there are probably many more trees down again. 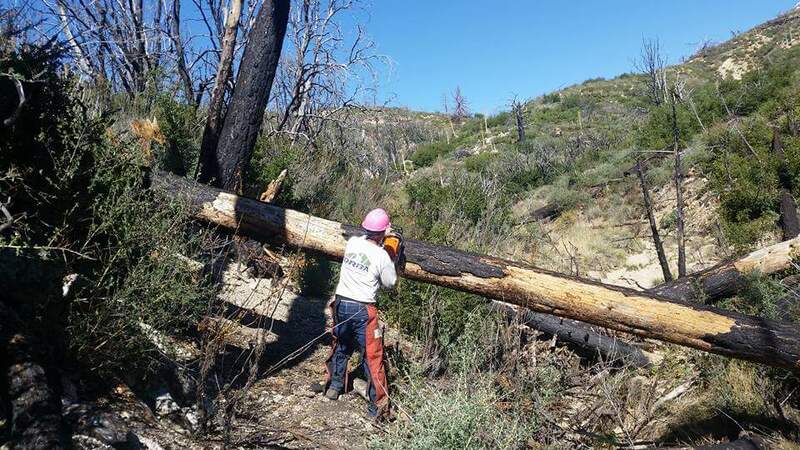 Currently the Forest Service, along with Fire Crews and us as Volunteer Sawyers, are developing a plan to clear remaining standing trees in the trail and road corridors, so that they don’t continue to fall across the trail every time the wind blows. Currently crews are doing that along the Santa Clara Divide Road so that it can be reopened to vehicles next year. We hope to begin restoration work on the Vetter Mountain trail next year, after we finish the Ken Burton trail. Stay tuned for details.